It’s difficult to categorize the Rep’s latest production. Ring of Fire: The Music of Johnny Cash isn’t a play, and although it’s full of music, it’s not exactly a musical or even a revue. It’s not even, strictly speaking, a concert, even though that’s what it most resembles. It’s basically an acted concert with commentary, and I don’t think I’ve seen anything very much like it before. It’s not what I was expecting, although it’s definitely entertaining. An energetic cast of performers and especially musicians makes for a tuneful, enjoyable evening. This strikes me as the type of show that would most ideally be performed in residence. at a Johnny Cash or country music museum. It’s not strictly a biography, although it certainly has elements of that, with the show’s two “Johnnys”, Jason Edwards and Derek Keeling, taking turns with the narrative and describing memorable incidents in the singer’s life. Much of the biographical focus centers on Cash’s relationship with his second wife, singer and musician June Carter, and this production also has two “Junes”: Allsion Briner and Trenna Barnes, with Briner mostly being paired with Edwards’s older Johnny, and Barnes with Keeling’s younger Cash. Briner also has some memorable moments as Johnny’s mother early in the first act. In addition to biographical material, the show is also an exploration of themes in Cash’s music, such as faith, suffering, country life, traveling, humor, and romance. There’s also a memorable sequence in the second act focusing on Cash’s songs about prisoners and prison life, such as “Folsom Prison Blues” and “Orleans Parish Prison”. It’s a celebration of the singer’s musical legacy, with as many songs as the show’s compilers could fit into its two acts, ranging from his radio hits (“I Walk the Line”, “Ring of Fire”, etc.) to traditional songs like “In the Sweet By and By”. Fans of traditional Country music, and of Cash in particular, are sure to find many songs they recognize well represented here. The format is somewhat chronological, starting with Cash’s recounting his ancestry and early life, and ending with his death, accompanied by a photo memorial projected on a screen. The four principals are energetic and engaging, with each having stand-out moments. Edwards, while not sounding very much like Cash, still has a strong presence, and especially makes an impression with “Man In Black” in the second act. Keeling, as the younger Johnny, has more of a Cash-like voice, and has some very strong moments with “Sunday Morning’s Coming Down” and “A Boy Named Sue”. Barnes and Briner also display strong voices and a great deal of energy in their roles, with Barnes giving a fun performance of the humorous “Flushed From the Bathroom of My Heart” and Briner excelling on the old hymn “In the Sweet Bye and Bye”. Both also demonstrate good chemistry with their “Johnnys”, trading verses on “If I Were A Carpenter” and other love duets. The four leads are also backed by an excellent group of musicians who occasionally play small roles in the dramatizations, and occasionally join in the singing. 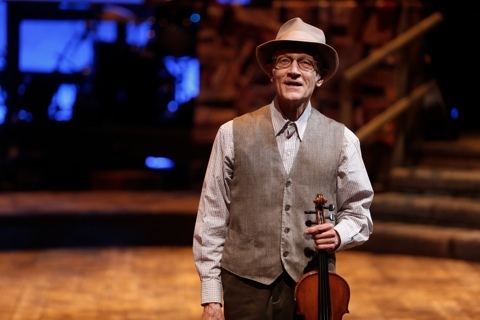 The standouts here are John W. Marshall in a virtuoso performance on the upright bass, and the charming, wiry Brantley Kearns on fiddle and in various singing and speaking roles, most notably in a memorable comic performance of “Delia’s Gone” in Act 2. It’s a very cohesive musical ensemble, bringing life and energy to this great catalog of songs. The striking set by John Iacovelli features an authentic-seeming country house with a front porch, where the musicians assemble in an extended jam session, and a prominent screen with evocative projections by Joe Payne. 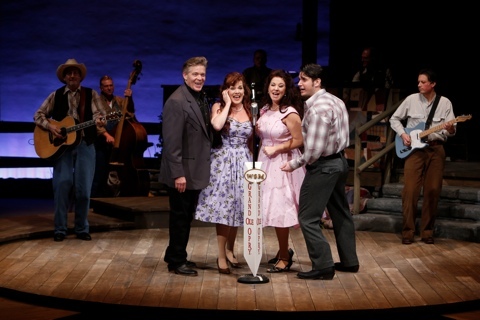 Pictures from Cash’s life, as well as various thematic images add to the overall atmosphere and tone of the production. There are also some excellent, colorful costumes by Lou Bird, ranging from classy black suits for the Johnnys to brightly hued dresses for the Junes, and various costumes such as prison garb and farmers’ work clothes for the thematic segments. As the subtitle states, this show is all about the music of Johnny Cash. It’s more about the music than the man, to a degree, although it can certainly be said that you can’t really separate this man from his music. The music is well represented here, from the poignant to the plaintive to the upbeat and whimsical. Overall, though, the tone is a more contemplative homage to the Man in Black. His fans especially should appreciate this show.